One of the most exciting times of the year is at our feet, the MLB playoffs. Here&apos;s our list of things you must do around Arlington before, during and after the next few home games! It’s the spookiest time of the year for Six Flags Over Texas!!! Now featuring NEW Fright by Night scare zones—Freaktown Side Show, Bio-Mech Sector, Camino de los Vampiros and Boomtown Terror. For the little ones, there’s Thrills by Day with Looney Tunes SPOOKY TOWN, Kid’s Costume Catwalk, Scary-Oke and Six Flags Spooktacular Street Party. Plus, much more – this year is packed with terrifying nights and spooky days. Head to Six Flags Over Texas Fright Fest for some screams and thrills. Every year Ripley’s Believe it or Not! / Madam Tussaud’s Palace of Wax transforms into the creepiest wax museum on the planet! This year is no exception—every Friday and Saturday starting October 9 thru all Hallow’s Eve— figure out which horror movie character (think Jason, Frankenstein, Leatherface and killer clowns) are real or made of wax in “Nightmare at the Wax Museum.” Then, if you’re not scared speechless, make your way through Ripley’s Mirror Maze, which will be haunted with characters who come straight out of your wildest nightmares. The Elvis Jabberdog Brownie – a two-ft long brownie rolled in Rice Krispy crust and dipped in funnel cake batter. Then, it is fried golden brown and topped with whipped cream. The Elvis Jabberdog Brownie Jr. – See above, but smaller. 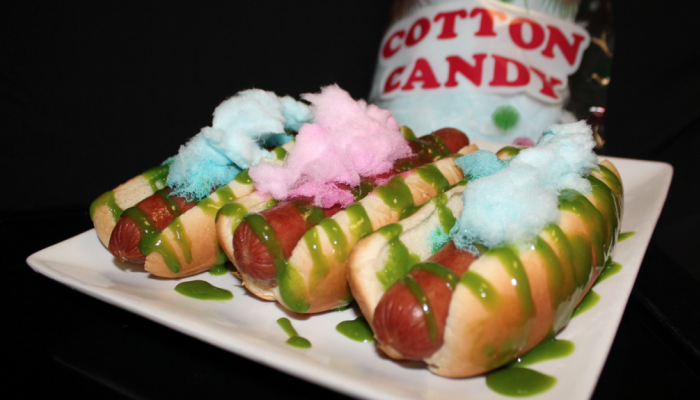 The Sweet Spot Cotton Candy Dog – An all-beef hot dog with cotton candy-infused mustard and topped with cotton candy so far-fetched we can’t wait to try it! The One-Pound Top-N-Go Cheetos –This one pound bag of Cheetos opened on its side and loaded with a protein— chili, taco meat, shredded chicken or brisket—then topped with nacho cheese. Jalapenos optional but recommended. Toppings vary by location at which you buy so scope it out before you get in line. The Inside-out Hot dog – A one pound, 8 inch, 2¾ inches around hot dog you most definitely have to eat with a fork and knife. The inside is loaded with your choice of mac and cheese or mashed potatoes and is then topped with brisket, chili or shredded chicken. Not to mention it is served on a delicious pretzel roll. Arlington Museum of Art has three exhibits going on now – Rock and Roll Billboards from the Sunset Strip, Backstage Pass: Baron Wolman and the Early Years of Rolling Stone and Austin Blues. Journey back into some of the greatest years of Rock ‘n’ Roll and gain some new knowledge and insight into the role of the music photographer. Segway X2 orientation, complete with one-on-one personal instruction This ensures that all participants feel comfortable on the machine before we begin the tour. Call in advance to book a tour at 817-631-3273. Arlington has sports. In turn, sports bars are big in Arlington. Whether you’re into catching a pregame meal or drink special, the city has a plethora of choices (and walls of TVs we might add) where you can root for your team. Click here to view our list of fun places to eat and/or watch the game here. Photo credit ESPN Sports Business Reporter & Correspondent Darren Rovell.